I’m usually positive, but recently I’m watching on slightly fearful when I view the recent Chelsea matches and with good reason I believe. Yes we’ve been gaining results, winning and are still five points clear at the top. There is no doubting we’ve shown a lot of character, fight, passion, team spirit and determination in order to grind out recent results, that is certainly a good thing. However, a lot like last season, we are controlling games, having a lot of attacking play but wasting chances and failing to penetrate the oppositions back line. Last season I put this down to the lack of a deeper creative player and a top class striker, this season we have that, so what’s been missing these last few games? It all started so brightly this season and we immediately showed what we were missing last season with Diego Costa scoring a lot of goals, and Cesc Fabregas creating them from deep. It was our missing formula and I still believe it is. So what’s gone wrong? Well, for start we’ve been without both of them in the last 2-3 games. However, they’ve both been present against Burnley and Paris Saint Germain, the two games that’s really caused my fear to generate. I think in the last two matches they’ve both looked tired and we know Fabregas has been suffering with a cold, I think it’s taken it’s toll. 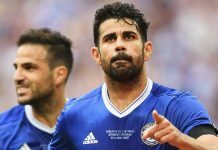 My other reasoning behind this as well as them both looking burnt out, I think Costa is allowing outside pressures to get to his performances and confidence, he’s looked ‘off’ recently and lacked the form he showed at the start and most of the season so far. I think it seems to be something in his mind that’s made him lose form. He’s getting involved in too many scuffles and arguments on the pitch and I know it’s his style to rattle defenders, but I think it’s having the opposite affect and rattling him. Players know how to wind him up and it’s working, such as David Luiz did in mid-week. When we’ve played without the two of them, it simply goes back to a frustrating mess like last season with Ramires being excellent, but not creating anything and their not being anything up top or a world class striker. Each week you’ve got the likes of Eden Hazard being the absolute menace that he is along with Willian doing similar creative stuff. But it’s the lack of imagination, confidence to shoot and final passes that is not allowing us to finish teams off and causing us to drop too many points. So far, we’ve been really lucky that Manchester City have had a few poor games and dropped points, otherwise they’d be above us right now. We need Costa to up his confidence, Cesc to be fully fit BEFORE he starts a game, and the rest of the team to have more shots and attempt those final passes that might not come off. It’s all about taking the risks and you can afford to do that so high up the pitch. Having said that, we’re still getting the results albeit Saturday when we all know that we were absolutely robbed. But we should not have even let it get to that point, we should have scored at least two in the first half and put Burnley out of the game. It’s the same situation that grew our frustrations last season. It’s a different story now though because we have the players to stop that, but fatigue, confidence and form is playing a part. Mourinho now needs to think of ways to get around this and get the best out of his team once again, which I really think he will.